Bored of usual looking text style and color while sending emails to friends? 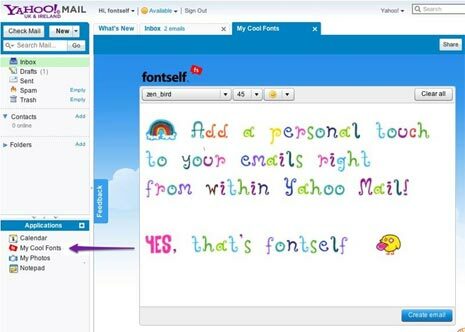 Now you can spice up text with radical looking stylish text and colors in Yahoo Mail using “My Cool Fonts” app. This app feature allow you to style email text with different looking font styles and color. Best part, this does not require any installation for usage. 1. Goto inbox of Yahoo Mail and click “My Cool Fonts’ option under ‘applications’ at bottom left. 2. In the pop-up window, select font type and size. 3. Type the email text and then click ‘create email’ button. 4. Your creative and colorful email is ready to be sent. You can also add additional (normal) text and attachments to the email message. How to send free SMS from Yahoo Mail to any mobile?